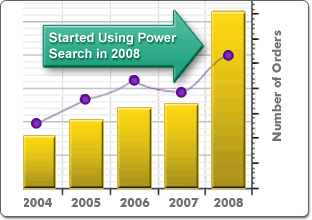 Power Search is a site search solution that works with any website. The below site search case study describes the goals, strategy and results from the use of Power Search by BassBurglarAlarms.com, an ecommerce site. To summarize, the site had a massive inventory, competitive prices and knowledgeable staff. All this was being held back by a tremendously slow site search. Installing Power Search caused highly positive results. View more examples of the Power Search site search solution in action. See what others have to say about Power Search in the site search community. 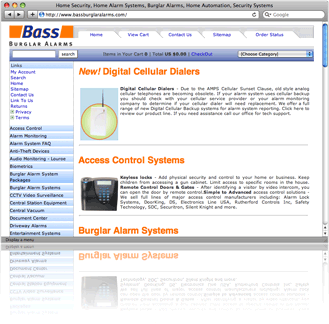 Client: Bass Home Security, Inc.
With over 250,000 products, BassBurglaralarms.com is THE place to find all the equipment you need related to alarms and other security devices. The site has a great product selection and a clean, intuitive interface. The site had one big problem: a very slow site search. Common searches took 15-20 seconds to perform which greatly exceeds the time that most customers are willing to wait. Once search results were displayed, a very basic search navigation system was available. Customers were not offered the proper tools to sort and drill down through the large inventory. Search results were relevant, but needed to be improved. With so many items, customers struggled to find the one that most closely meets their needs. The primary goal was to speed up the site search. Making a customer wait 20 seconds to view search results equates to lost sales. A secondary goal was to improve search navigation. This would allow customers to easily sort through huge product categories and find a product with the desired features, brand and price. The final goal was to improve the relevancy of search results. A straight-forward strategy was used. Power Search Enterprise was installed. The automatic set of filters was used to provide a greatly-improved, faceted search navigation system. Power Search settings were configured to optimize the search layout and results. An immediate increase in sales occurred. Sales nearly doubled! The time to perform a search went from 15-20 seconds to well under 1 second. Customers received relevant search results and were able to locate products easily using the search navigation. Phone calls from customers who could not find an item decreased. Overall, Power Search had a profoundly positive effect on BassBurglarAlarms.com. Even in the current gloomy economy our sales have nearly doubled. The only change we made was to give SF the green light to make our sites faster and more efficient. Prior to the upgrades we were getting plenty of traffic but a lot of people were not buying because it took too long to redraw pages, especially search results pages. Now it's lightning fast and people are sticking around to buy.